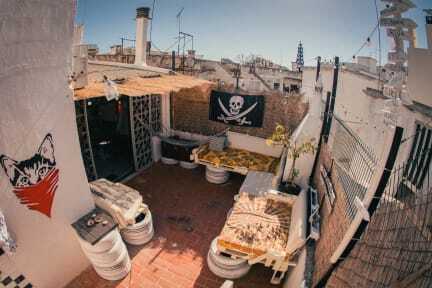 The humble pirate inn is a unique alternative hostel in Faro, right in the heart of Portugal’s beautiful Algarve region. This lovely home-away-from-home is located in an authentic portuguese family townhouse smack-bang in the center of Faro - only minutes away from everything the city has to offer and a bike ride away from the sandy beach and the adorable Flamingos. This independent hostel is the brainchild of a portuguese seasoned traveller who puts the needs of his backpacking guests first, and during his years of travelling found that the best hostels are often the smallest. This cosy Portuguese house is a 16 guest special with 2 dorms, 2 privates, a home-style kitchen, comfy handmade common areas, tv room and sunny backyard. It’s a real home-away-from-home for the laidback weary backpacker and lover of the humble chillout. Now while certainly it isn’t the hilton, it’s guaranteed you’ll be treated with kindness, you’ll leave with new friends and maybe even a ever-burning desire to keep coming back. Our friendly and scruffy-looking crew will do everything within their reach to provide you a clean and cozy stay and aim at giving you the best advice about Faro and its surroundings.